When moving to a new Country, City or even Campus, it is important to be aware of rules and safety notifications. It is also important to understand your rights as an international student in Australia. Please read the information below and in this Safety and Security Handbook. Below is important information on staying safe on Campus, it is important to read this information and to be aware of Campus warning systems and notices around the building. Whilst on and off Campus it is important to secure your belongings and do not leave them unattended. If you find or have lost an item please hand it in or report to Main reception on Level 4. Campus evacuation plans are located on each floor of the building next to the lifts and fire exit doors. Please take note of the location of the fire exit doors on each floor and the location of the external meeting spot. In the case of a lock in or evacuation always follow Lecturer and Fire Warden instructions and PA system warnings. 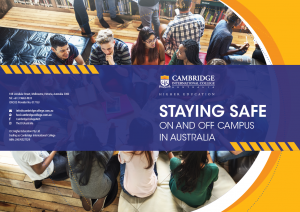 The best way to keep our Campus safe is to encourage a Campus-wide safety campaign, so all staff and students are responsible for keeping each other safe. If you see something that doesn’t seem quite right, say something. Its better to speak up then leave it. Security guards are located on the Ground floor of the Campus and can be contacted if assistance is required within the building. All guests must sign in and out of the building to ensure their safety in case of an evacuation and for the safety of our students. The R U OK? Campaign is not just limited to a monthly campaign, every day we should be asking those around us, are you ok? CIC has a counselling service available to all students. Our three professional counsellors are located on level 3 and is a free and confidential service. Moving to a new country is a huge step, some things here in Melbourne and Australia will be different from where you are from, especially rules and safety notifications. Below are some tips for staying safe, also see the CIC Safety Booklet for further information. – At night, walk on well-lit roads or take a taxi. – Only use your headphones in one ear when listening to music while walking. – Only cross the road when the ‘green man’ notification light is showing. – Never use your phone when driving. – The Driver and every passenger must wear their seat-belt. – Follow the road rules and speed limit. – Never turn off smoke alarms. – Think before you cook – never leave your cooking unattended. International Students have the same renting rights as local residents have under the Residential Tenancies Act 1997. You have the right to ask your landlord (the owner of the rental property) or property manager to meet the obligations agreed in your rental lease – this will not affect your visa. The Fair Work Ombudsman (FWO) works with the Department of Immigration to help you understand your legal rights and responsibilities when working in Australia. You can also ask the FWO to help resolve issues about pay and other entitlements at work.